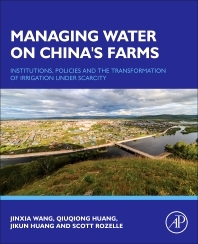 Managing Water on China's Farms: Institutions, Policies and the Transformation of Irrigation under Scarcity is a comprehensive and current look at the water shortage problems in China. While China has emerged as a major player in the world economy, water is the most critical factor that limits the country’s further growth. China’s growing water problems also have a large impact worldwide, with public health as well as economic impacts. If China were to rely heavily on food produced outside of China, the massive volume of food imports would raise food prices internationally. This book examines a series of water issues, beginning with a description of the water shortage problems in China, particularly in the northern part of the country. It then looks at the government and farmers' responses and whether past policies have been effective in resolving the water problems. Managing Water on China’s Farms documents the change of existing and new water management institutional forms over time and across provinces throughout northern China, and then assesses the impacts of these changes in the rural sector. Finally, it examines potential solutions that the research has uncovered, answering the question: Who can build the bridge over China’s troubled waters? Using analyses from information collected firsthand in China’s rural villages, the series of surveys covers diverse geographic regions that are representative of north China and includes perspectives from multiple stakeholders such as village leaders, water managers, and farmers. The policy-oriented research and rich analysis in this book make it of interest to both policy makers and researchers with a focus on China water problems. This book can also be used in a Master or Ph.D. level resource economics course. Do Groundwater Markets Help the Poor? Why Are WUAs and Contracting Used in Some Areas but Not Others? Organizing China's WUAs: The Five Principles? Jinxia Wang is the Deputy Director and Professor at Center for Chinese Agricultural Policy (CCAP), Chinese Academy of Sciences (CAS). She is also a Professor, Institute of Geographical Sciences and Natural Resources Research (IGSNRR), CAS. Her research focuses on water management, institution and policy, climate change (impact evaluation and adaptation strategies), and rural environmental policy. She received her Ph.D. in Agricultural Economics (2000) at Chinese Academy of Agricultural Sciences. She has published more than 150 papers (more than 60 are in English) and four books. In 2009, she received the Outstanding Young Scientist Award from the National Natural Science Foundation in China. Qiuqiong Huang is an Associate Professor at University of Arkansas. Her research focuses on natural resource economics (with an emphasis on water and land) and development issues including education, migration and labor market outcomes. She received her Ph.D. in Agricultural and Resource Economics (2006) at University of California, Davis. Her publications have appeared in Agricultural Water Management, American Journal of Agricultural Economics, Australian Journal of Agricultural and Resource Economics, Ecological Economics, Environment and Development Economics, Food Policy, Journal of Productivity Analysis, and Water Resources Research. Jikun Huang is the Founder, Director and Professor at Center for Chinese Agricultural Policy (CCAP), Chinese Academy of Sciences (CAS). He is also a Professor, Institute of Geographical Sciences and Natural Resources Research (IGSNRR), CAS. He received his Ph.D. in economics from University of the Philippines at Los Banos in 1990. His research covers a wide range of issues on China's agricultural and rural development, including work on agricultural R&D policy, water resource economics, price and marketing, food consumption, poverty, trade policy, and climate change. He received the Outstanding Scientific Progress award from the Ministry of Agriculture four times, Award for China’s top ten outstanding youth scientists in 2002, Outstanding Achievement Award for Overseas Returning Chinese in 2003, Outstanding Contribution Award on Management Science in 2008, the UPLB Distinguished Alumni Award in 2008, and 2010 IRRI’s Outstanding Alumni Award. In 2013, he was elected member of the World Academy of Sciences (TWAS). He has published more than 400 journal papers, of which more than 200 papers in the international journals, including Science and Nature. He is co-author of 18 books. Scott Rozelle is the Helen F. Farnsworth Senior Fellow and the co-director of the Rural Education Action Program in the Freeman Spogli Institute for International Studies at Stanford University. His research focuses almost exclusively on China and is concerned with: agricultural policy, including the supply, demand, and trade in agricultural projects; the emergence and evolution of markets and other economic institutions in the transition process and their implications for equity and efficiency; and the economics of poverty and inequality, with an emphasis on rural education, health and nutrition. Rozelle's papers have been published in top academic journals, including Science, Nature, American Economic Review, and the Journal of Economic Literature. He received his Ph.D. (1990) from Cornell University.